This streamer was posted on Streamers365.com on October 16th, 2012. It is an original streamer pattern that I created back in the spring of 1998 when I was tying what ended up being two-hundred-fifty-plus streamer and bucktail patterns for my involvement in the book, Forgotten Flies and the chapter titled, Checklist of Streamers and Bucktails. What a fun time, and wonderful opportunity to expand my range and diversity of tying streamers and bucktails. I enjoyed the challenges of tying these flies, such as the entire series of Keith Fulsher’s Thunder Creek minnow patterns; Joe Brook’s Blonde series, Bob Bibeau’s sparsely-dressed, multi-layered bucktail streamers that were created for Maine’s Sebago Lake, and a fair number of tandem streamers, new for me at the time. Forgotten Flies is where the Grizzly Orange streamer was initially published. The Grizzly Orange streamer, original pattern design by Don Bastian. Photo by Darren MacEachern, posted on Streamers365.com, October 16, 2012. The creation of the Grizzly Orange began with a single component – orange-dyed guinea fowl. I had an urge to use them for shoulders on a streamer. Once that was determined, the additional ingredients of grizzly and orange were combined to produce this pattern. It was created in 1998. Thanks for the great photo, Darren! This entry was posted in Fly Pattern Recipes, Streamers and Bucktails and tagged Grizzly Orange, Streamers365.com. Though not usually a big fan of the color orange, I’ll make an exception here: really nice fly! And…your work in Forgotten Flies is also exceptional. I go to that book whenever I need some fly tying inspiration. Thanks for your comment on this fly! And your taking exception to orange. 😉 I appreciate your compliment on my Forgotten Flies work as well. That project seems so long ago now, guess it was at about 12 – 13 years, but since I did the Bergman flies and biography in that work, plus the streamers and bucktails; I still feel that is thus far the crown of my tying career. Thanks for your support and encouragement! That’s good news Don that you are traveling again! I’ll be there. 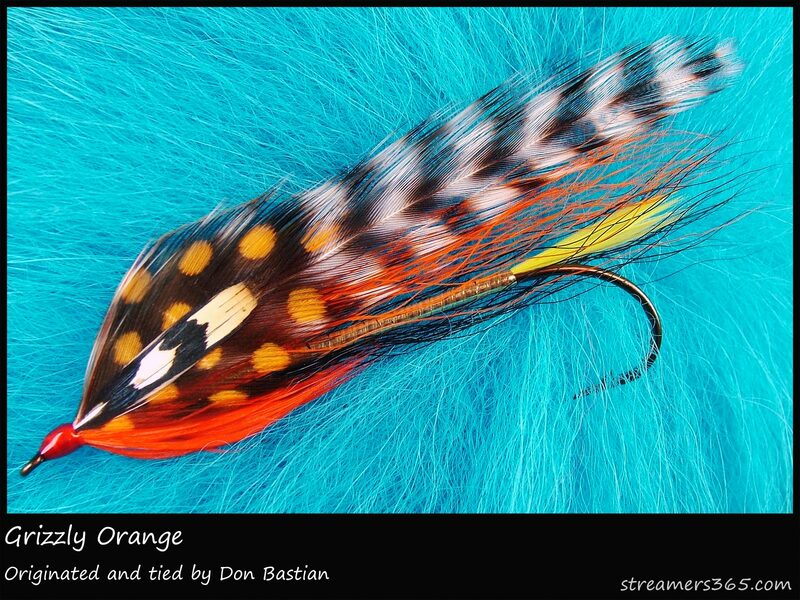 I really like this one, Don, and I was fortunate enough to win it in the Streamers 365 Auction for that month. It’s great to see all these hidden treasures of yours; thank you for sharing them with us. Wow! How nice that you have this original! Thanks for bidding on it! I also am going to post the rest of my original streamers here too. Soon. The Committee, High Roller, Ace-of-Spades, and the Carrie Stevens Yellow Witch, just since I have thus far posted all my flies from Streamers365.com to the blog as well. Thanks for your comment and compliment, Jim. See you soon!